Nowadays there are so many fears about home security and what’s legal and what’s not when it comes to protecting your home. The government have recently said that they will introduce more relaxed laws on self-protection against burglars within the home. The chances are that your home is likely to be burgled during the day whilst out of the house. You may have already taken other measures to secure your home, such as a burglar alarm, exterior CCTV cameras – fake or real, they’re still off-putting! Here we look at ways that you can set up remote cameras in order to protect your home. This could be equally useful if you want to monitor a sick pet at home or to record antisocial behaviour or trespassers outside your home, discreetly, through a window. You can do all this, and check in with what’s happening at home, from your desk at work. 1) The main points of entry: the front and back doors or patio doors (especially vulnerable as glass is so easy to smash in order to gain access). 2) Living room: this is usually where the TV, computer, games consoles and other gadgets are kept. 3) Anywhere else that you are experiencing problems: perhaps pointed at side gate if you are getting trespassers, or your neighbouring fence if next door are attacking your hedge! 4) Baby’s room: if the security system is to observe home help. You’ll need to choose from which device you’ll be running your cameras in the house. This might be the desktop PC, the iPad, the tablet or the laptop – whichever you leave at home. Choosing the right software and hardware is the next step. You can choose to buy a kit from a specialist home security company, but these can cost £250 upwards. It is quite simple to set something up from scratch and with cheaper bits of kit that you can pick up online. Using wireless cameras means that you can cover more of the house; however, if you don’t want your webcam vying for bandwidth with other appliances – other laptops, computers, phones – and you only want one camera at the point of entry, you might want to opt for a longer cable instead. You can pick up basic webcams from the usual techie outlets (PC World, Comet etc.) but you might also want to try the computer sections of larger supermarkets, which often have bargains on webcams. • Ensure that if you are using cables for the cameras, that they are all plugged into the computer. • If not using cables, ensure that the WiFi cameras are installed on the computer with their individual IP addresses (so that the computer recognises them). • The software being used is then installed and configured (they usually do this automatically) to detect motion in the picture they receive from the cameras. • Download the app on your smartphone or your work computer or laptop. • When the software detects any motion it will record a clip and upload it to an external location. • The better software will tell you when this happens so you can check in real time. • You can then view the camera in question to see if there is indeed a problem at home, and you can decide whether to call the police. The tinyCam monitor is available as a free download or a ‘pro’ download at Blackberry App World. It can support up to 16 cameras, but these cameras must be compatible with the software (list here), so check before you buy. What’s nice – and unusual – is that the app doesn’t suffer from any intermittent adverts. The iCam app lets you check multiple cameras from your iPhone, iPad and is cheap on iTunes £2.99. According to reviews it only works well if you have Wi-Fi. You can use with regular webcams, without having to fork out for expensive kit. Webcams can be as cheap as £5. You’ll need to download the iCamSource software, which allows you to receive notifications about motion-sensed events. The software runs on Windows, XP/Vista/7 and Mac OS X 10.4 and later. You can check the cameras from your iPad, iPod Touch or iPhone. Earlier this year, Samsung announced security-specific cameras called SmartCams. The apps cover iOS and android platforms. These cameras are really simple to set up – they run off WPS so you just need to power it up and go with no software needed. The SmartCam is motion activated and also has Infra Red LEDs, so you get night vision too. The set up is done on an app on your phone or within your browser on your laptop. Just give it your YouTube account details and you’ll get 30secs of video each time the camera is motion- and audio-activated. These are available to pre-order at the moment. It is worth noting that whilst CCTV laws do not apply in private residences, when they overlook public or other people’s private property they mustn’t breach privacy unnecessarily, i.e. don’t focus on a neighbour’s bathroom or bedroom. If you have any concerns about the law in respect to CCTV, or any questions about home security in general, it is worth calling your local police station for advice. You can use the Police Service’s non-emergency number – just dial 101. 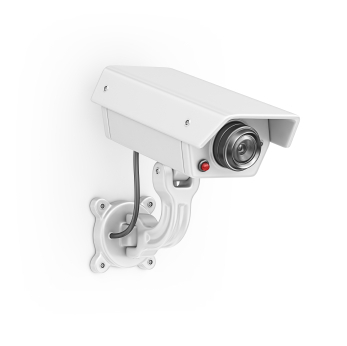 To get the best out of your new home security system you can also install notices on the back and front doors that say something to the effect of, “Smile you’re on camera!” This has been known to be deterrent enough. For those really determined burglars, you’ll be safe in the knowledge that your camera will capture the burglar’s movements, and the police will have a better chance of capturing the burglars! An Englishman’s home is his castle and, like any castle, it needs good security. Rather than drawbridges, arrows and moats your best form of defence is technology. We wish you the best of luck setting up your home security system!